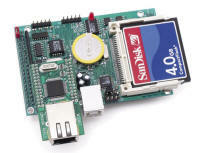 The EE is an ideal TCP-based embedded stand-alone board. It is a high-performance (80 MHz, 186 generation) networked controller with high-performance hardware TCP/IP stack, USB 1.1/2.0 slave interface, high-speed ADC, CompactFlash filesystem. Ideal for both OEM or prototyping purposes, the Ethernet-Engine is intended for demanding networked industrial process control and networked high-speed data acquisition applications. 80 MHz Ethernet controller with high-performance hardware TCP/IP stack, USB 1.1/2.0 slave interface, high-speed ADC, CompactFlash filesystem. The ideal TCP-powered embedded stand-alone board. High performance, low cost, C/C++ programmable controller based on a 40 MHz R8820(5V) or 80MHz R1120(3.3V) 16-bit CPU. Ideal for both OEM or prototyping purposes, the Ethernet-Engine is intended for demanding networked industrial process control and networked high-speed data acquisition applications. As embedded systems have developed, advanced connectivity has become another critically important aspect of modern embedded products. The EE addresses this by also integrating advanced connectivity solutions such as hardware USB and TCP/IP network modules, plus Windows compatible FAT16 file system, making this the ideal core platform for your next-generation projects. For less than $65 (OEM), the EE can be configured to act as a complete, stand-alone, high-bandwidth embedded webserver. No other system or circuit needed; the RJ45 connector is directly onboard. Your website files can be copied directly onto the PC-compatible CF card, for easiest deployment. Or, the EE might also be used as an inexpensive, stand-alone intelligent Ethernet/TCP traffic logger capable of storing filtered data into the integrated CompactFlash interface (200+ KB/s). The optional onboard WIZNET Ethernet module with RJ45 connector provides 10M/100M base-T network connectivity. This module represents a huge leap forward in performance when compared to other raw MAC-only embedded Ethernet networking solutions commonly in use today. Most other Ethernet solutions offer only hardware MACs, meaning "networking" your embedded controller means taking away any chance for real-time embedded control. The E-Engine board (and other TERN units featuring I2CHIP) is a next-generation solution far superior to these other basic solutions. This module releases internet connectivity and protocol processing from the host processor, presenting a huge improvement over software-based embedded TCP/IP stacks. No processor cycles are used to track packet transmission/retransmission, timeouts, etc. The resulting system can easily handle transmissions in the 150KB/s+ range in real world applications, leaving the board free to manage other true real-time behavior. Software libraries and demo project demonstrating TCP and UDP clients/hosts, HTTP webserver, and more are provided. The WIZNET module has a hardware LSI TCP/IP stack implementing protocols like TCP/IP, UDP, ICMP and ARP. Four independent sockets can be handled simultaneously, with a peak 4 Mbps protocol processing speed. It has a 16KB internal transmit and receiving buffer mapped into host processor?s direct memory. The host can then access the buffer via high speed DMA transfers. The EE integrates a USB stack chip to offer a very low overhead USB 1.1/2.0 slave interface. The onboard hardware fully handles USB stack processing, and provides large transmit/receive hardware buffers for high-speed bi-directional 8-bit parallel communication. No USB specific firmware programming is required on the controller side. On the PC side, Virtual COM Port (VCP) drivers are available, supporting peak practical transmission rates of 150 KB/s. The EE supports up to 2 GB mass storage CompactFlash cards with Windows compatible FAT file system support, allowing user to easily transfer large amounts of data to or from a PC. The EE features ACTF Flash (256 KW) and battery-backed SRAM. It has 3 timers, 20+ PIOs, 512-byte EE, 2 RS232 ports. A real time clock (DS1337, Dallas) is available. The EE can be powered via USB connector, or regulated 5V. Two pin screw terminal can be installed replacing USB socket plus a 5V regulator allowing DC power of 9-12V. The EE works with most TERN expansion boards. A high-speed upgrade package for the EE40 is available. This upgrade package will approximately double the boards performance by doubling the clock rate to 80 MHz. As part of this package, a special 20ns high-speed SRAM component (128 KB or 512 KB) is installed. This SRAM component can not be backed up by onboard battery. Similar controllers include the R-Engine-L, which features the same Ethernet interface but adds more ADC/DACs as well as numerous other industrial I/Os. The R-Drive adds industrial I/Os, but features a slower, older Ethernet MAC solution. The FlashCore-B is another small form factor solution for basic data acquisition to CompactFlash, but without the support for Ethernet/TCP communications. Expansion boards: MotionC, P300, Relay-7.